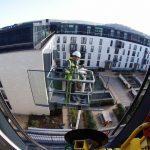 The existing glass of this penthouse flat in Bath had broken as a result of Nickel Sulphide Inclusion. The Glazing Face replaced the glass using a trolley crane internally and spider MEWP (Mobile Elevated Work Platform) externally, with a team of 4. Basildon County Court’s main atrium had been neglected for many years. 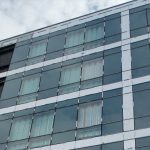 The Glazing Face were instructed by Coniston Construction to completely overhaul the glazing. 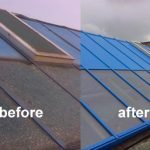 Following the instruction we replaced all of the glass with solar control glass and replaced the existing insulated cladding panels with new powder coated insulated panels. 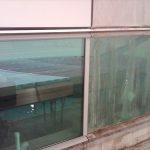 One Glass Wharf in Bristol had severe issues with water ingress through the curtain walling, The Glazing Face were instructed by Balfour Beatty to completely strip the curtain walling back and replace any missing or poorly installed components.